How do you heat a roof-top greenhouse so that veggies can be grown in the cold seasons? By capturing waste heat from the laundromat and bakery below it, of course! Roof-top greenhouse in New Hazelton, BC, on Hwy 16. Just over a year ago, a greenhouse was installed on top of the building that houses the Skeena Bakery and the Cleaners Laundromat in New Hazelton, BC. 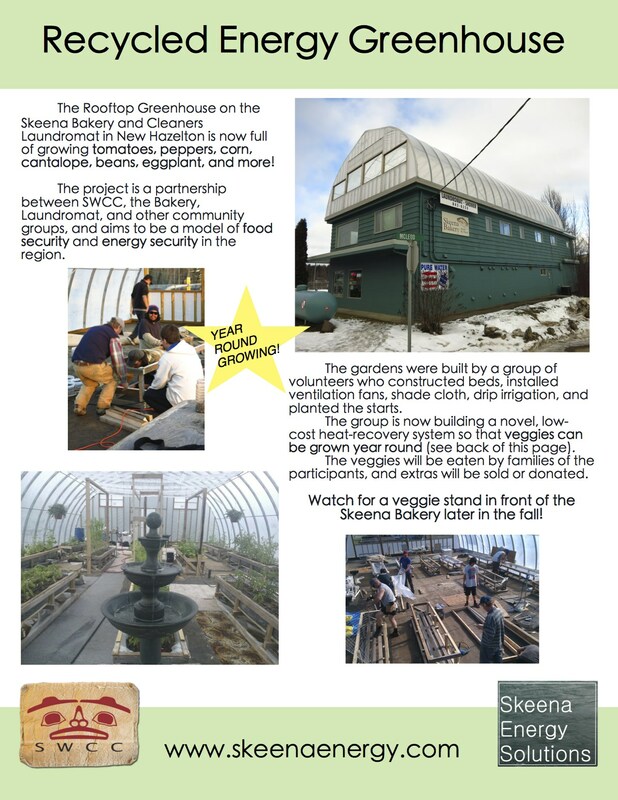 As a joint project between Skeena Energy Solutions, the Skeena Bakery, Cleaners Laundromat, the building owners, and a number of other community groups, the greenhouse will soon be transformed into an alternative-energy-powered organic food garden. The veggie plants will be kept warm during the cold seasons by capturing and utilizing waste heat that is currently exhausted outside the building from the clothes dryers in the laundromat and from the bread ovens in the bakery. 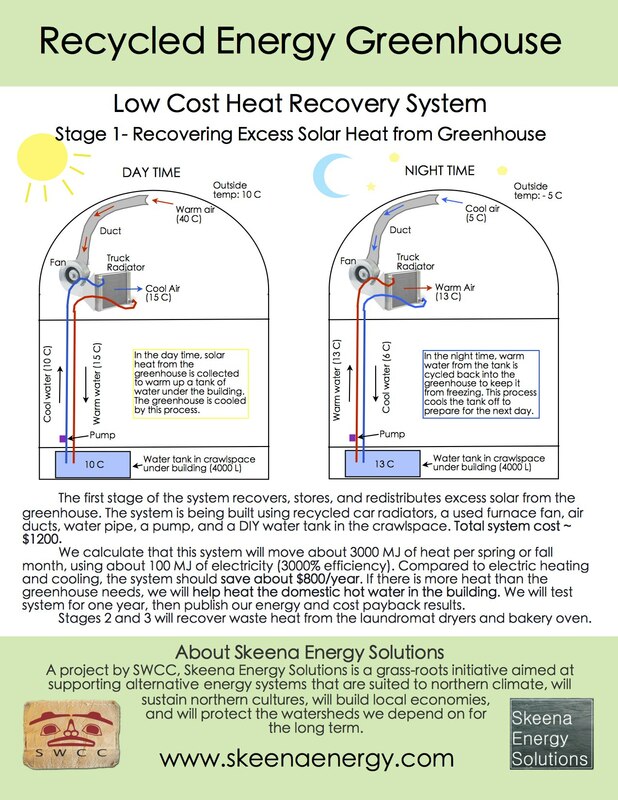 The low-cost heat recovery system will also capture, store, and re-use excess solar heat from the greenhouse itself. By producing local food for the community using energy that would otherwise be a wasted resource, this project will address issues of food security, energy security, and economic sustainability in the region. The garden will also increase energy security by producing nutritious food without relying on the energy-intensive shipping of mass-produced food to our northern location. The organic garden beds and heat-recovery system will be built and cared for by a group of local folks who will gain skills and confidence in organic food production, alternative energy systems, and produce marketing. If successful, we hope that this model can be replicated on roof-tops in other northern communities. To learn more, or get involved, please contact us! This project is supported, in part, by the Kassandra Trust, the Bulkley Valley Credit Union, and by the Walmart-Evergreen Green Grants program. Sam admiring the tomatoes growing in a raised bed in the greenhouse. Some of the beds contain birch shavings as a growing medium in order to cut down on weight and cost. All nutrients in these beds are provided by compost tea dripped in with irrigation water. We are now into our second season of food production. We started work this spring by constructing a drainage catchment system under our rasied beds using recycled eavestrough and a sump pump. Now all of the water and nutrients from the raised beds is captured and recycled through the irrigation system. We got our plants in early this spring, and had a large early crop of cucumbers before we lost some plants to spider mites. We have a very healthy crop of tomatoes ripening already, and pepper plants that are 3 feet tall. What a great first year! From staring at an empty greenhouse in April of last year, to harvesting the last tomatoes, cantaloupe, and cucumbers in October, the group of hard-working volunteers all agree that the first year was a big success. Throughout the spring and summer, a group of 5 - 10 volunteer men came together once or more a week to build raised beds, install a ventilation fan system, irrigation system, drainage system, and then grow and eat veggies. The summer was a scorcher, so excess heat was our biggest problem, with the greenhouse reaching 45 C many afternoons. After we hung shade cloth high above the plants throughout the greenhouse, the temperature steadied somewhat. The crops that did well were tomatoes, pole beans, cucumber, some pepper varieties, and cantaloupe. The corn, squash, eggplant and tomatillos struggled, but we have some good ideas for next year. In June we held an open "green"house the same day that the Skeena Bakery celebrated its 5 year anniversary. Over 150 people came to the event and toured the greenhouse, and some ate chili cooked in our passive solar cooker. At harvest time, the volunteers shared the produce with their families and friends, and on a few occasions we sold excess veggies at the picnic table in front of the bakery. We held a harvest celebration meal in October to mark the end of the first growing year. We decieded to take a break through this winter, and will start again next spring with early crops. We intend to finish building the heat recover system through this winter. The long-term goal of year round growing is getting closer! We are looking into LED lighting for the dark months to compliment our alternative heating system. Construction is now in full swing! 15 raised beds were built, and are now filled with tomatoes, peppers, cucumbers, pole beans, cantaloupe, corn, eggplant, squash, tomatillos. Ventialtion and irrigation systems have been installed, and work on the heat-recovery system has begun. According to our calculations, the largest source of useable heat is actually from excess solar heat in the greenhouse itself (it can get to 70 C without fans running!). To capture and re-use this heat, we hope to build a low-cost system using recycled car radiators and a large water tank in the building crawlspace. If our numbers are correct, this system will provide enough heat not only for the greenhouse at night, but also to help heat the domestic water used by the laundromat and bakery.